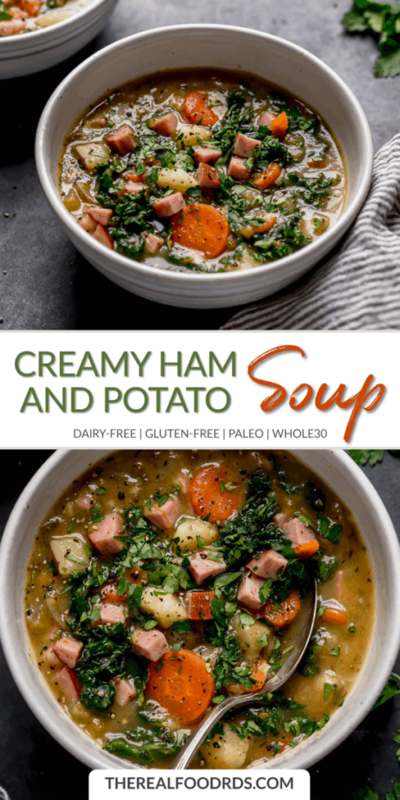 Creamy Ham and Potato Soup without dairy? Oh yes, it’s a thing. Really, you do because it’s like a big warm hug in a bowl. 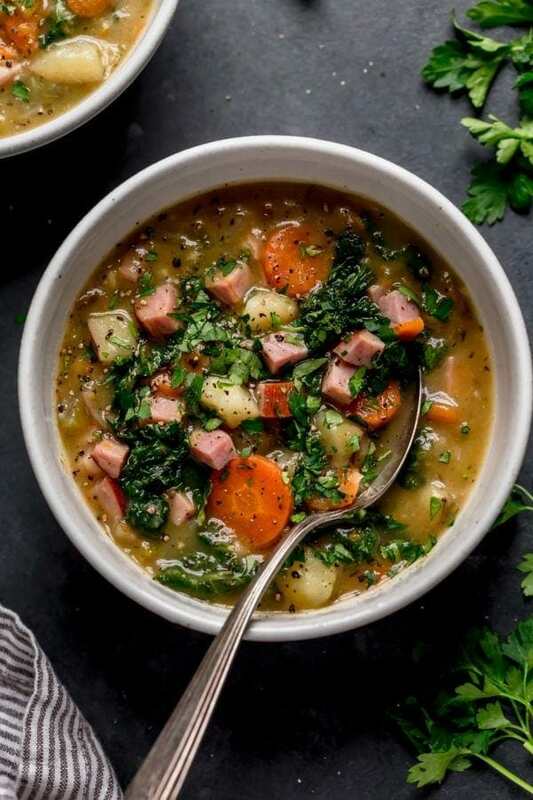 Chock-full of veggies and big chunks of the most dreamy uncured, no sugar ham, it’s exactly what you need to ward off the winter chill and fill your belly right now. I seriously can’t get enough of this soup right now – and neither can my 5-year-old. She asks for it every day. I don’t blame her. I’m pretty keen on it for breakfast right now. Seriously though, soup with kale that your young child will happily slurp down without picking out the green bits? That’s nothing short of a kitchen miracle. Of course, the hubby loves it too. 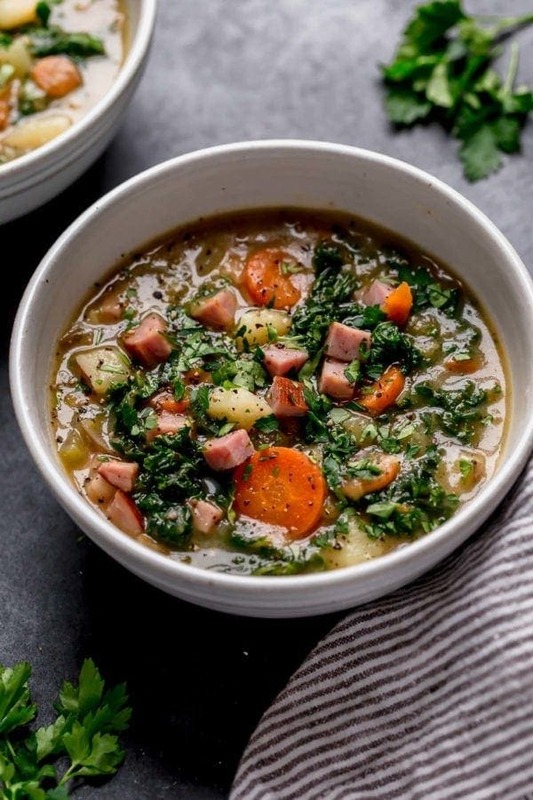 But what’s not to love about creamy ham and potato soup made without dairy or sugar – which just happens to make it Whole30-friendly in addition to being utterly delicious? Let’s chew the fat about fat for a minute, shall we? I just want to point out that because this soup has no added fat from the cream or whole milk you’d normally find in a creamy ham and potato soup recipe and the ham is incredibly lean – you need to add some fat. Fat makes food taste amazing, it helps you absorb certain vitamins and it’s satisfying. So let’s get some fat in there. Really, any fat will do but ghee is my favorite for this recipe since it lends a mild, buttery flavor to the soup. But if you can’t tolerate dairy then avocado oil or olive oil will both work well. Enough chatter, eh? Let’s all make soup. Calling in sick to work to make soup, that’s legit right?! Okay, the voice of reason says it’s probably not but thankfully this is a great recipe for either making ahead and rewarming (or freezing if you like to be really prepared and on it) or you can pre-chop all the vegetables and ham and store them in the fridge until you’re ready to actually make the soup – thus saving yourself 20 minutes of prep time with this last option. 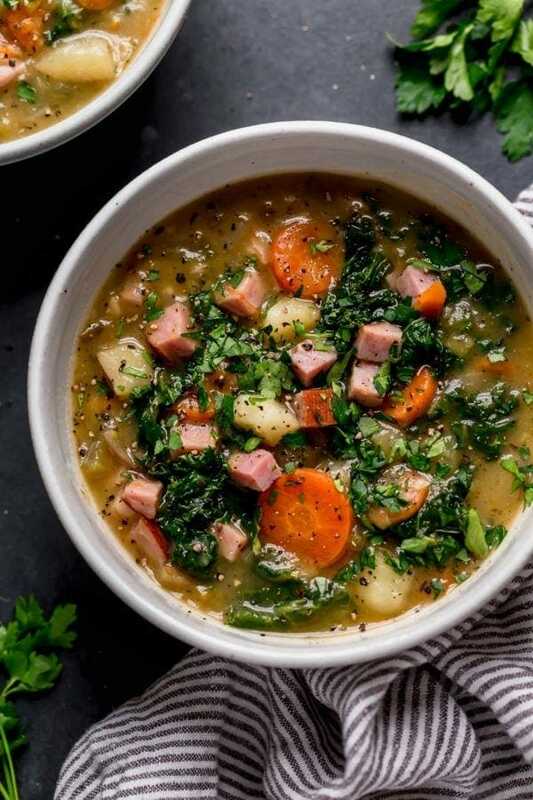 You could even toss it all in the slow cooker (minus the ham and kale) and cook on low heat for 7-8 hours then proceed with the recipe as written. It’s totally your call. But let’s all make a pact to make soup happen this week, ok? Feel free to double the recipe, it freezes beautifully! 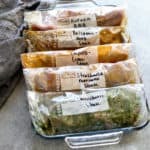 To freeze, transfer soup to freezer-safe containers (such as these) and allow soup to cool completely in the fridge before freezing. Soup will keep frozen for up to 6 months. To thaw soup, place in the fridge for 24 hours or place container in a bowl of cool, running water in the sink before transferring to a pot on the stove to reheat. Place a Dutch oven or other large pot with a lid over medium heat. Add fat/oil and when melted, add onion, carrot, celery, and leeks. Saute for 5-7 minutes, stirring occasionally until onions start to soften. Add potatoes, broth, and thyme. Bring soup just to a boil then reduce heat, cover and simmer until potatoes and carrots are tender – about 30 minutes, depending on how large they are and how vigorous the simmer. What’s your favorite soup and why? We’d love to hear about it – share in the comments below! My newly paleo family ate this up tonight. Delicious. Perfect for the cold weather we’ve been having in Seattle. Thank you! Wow! That’s incredible! Thanks for sharing – glad we could help you serve up something your family loves and to help ward off that PNW chill. Another Seattle-lite here! Made this recipe this week for a group of people and it was a hit! The only change I made was to leave out the Kale, but that was only because I forgot to include it in my grocery order. Can’t wait to make it again! Seattle + Soup must be a thing right now with all the cold, wet weather. So glad you loved it! 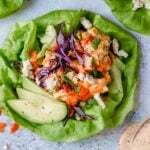 What type of ham do you use for this recipe so that it is Whole30 compliant? What stores carry it? I use Pederson’s Natural Farms Spiral Sliced Ham which can be ordered online at The Simple Grocer. You can also look for a Whole30-compliant deli ham and ask to have it sliced thick (so you can then cube it). You may need to use less salt in the recipe if you ham is really salty. 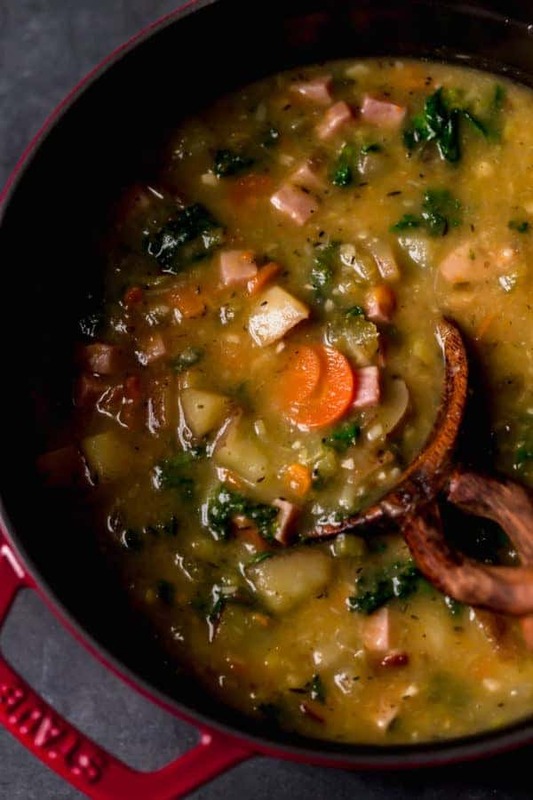 I have a huge bag of russet potatoes to use up – do you think they could work in this soup? You can definitely use Russet potatoes. You may want to peel them (or at least half of them) since their peels are tougher than those of red potatoes. I often use a mix of both if that’s what I’ve got on hand and it always turns out great. I just prefer red potatoes for the fact that they don’t need peeling, they’re pretty in soup and it’s what we grow in our garden every summer. Yukon golds will also work, too. I just made this dish (in my Instant Pot) and it is phenomenal! I highly recommend :). Thanks for the share. Thanks, Melanie! I’m so glad you loved it. It’s a huge hit at my house too. 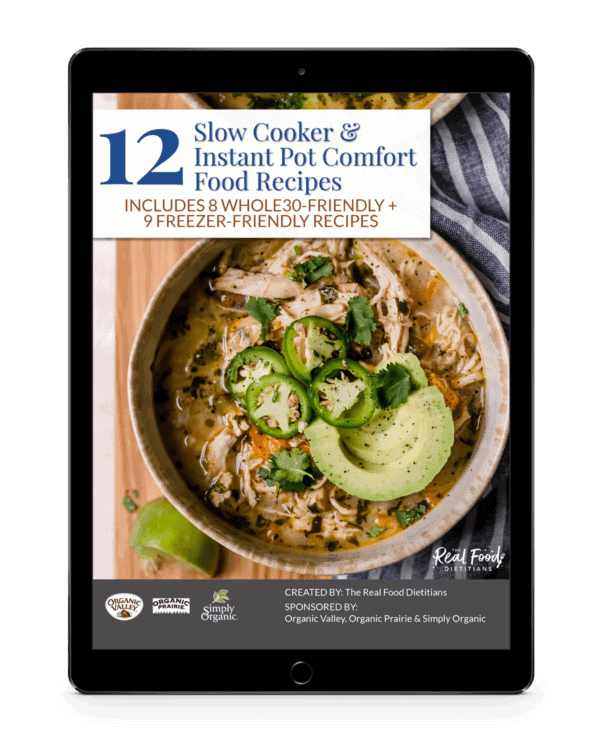 Would you mind sharing how long you cooked it in the Instant Pot? I know a lot of people will want to know and I’ve only made mine on the stove. 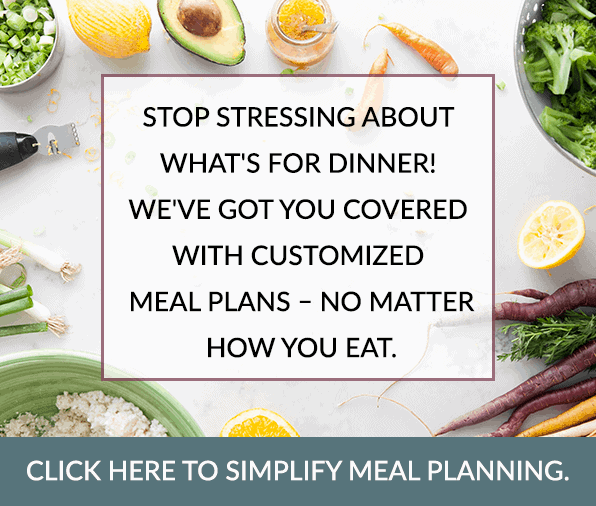 Did you just throw everything into the instant pot? How long? That’s a great question! This is a guess but I’m thinking 12-13 minutes on manual/high would be good. 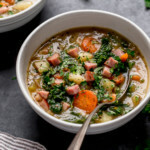 I would cut down on the broth to 2 cups (you can always add more at the end) and hold off on adding the ham and kale until after the 12-13 minutes of cooking and blending. Then turn the IP to sauté and add the kale and ham to finish plus additional broth as needed. Hope this helps. If you give it a try let us know how it turns out! Excellent recipe! This was so good and filling! Thanks, Becca! I’m so happy to hear you loved it. It’s one of my favorite soups – making it this weekend! Who else blended up the ham with everything… 😀 Great recipe tho! This is such a wonderful soup — eating it right now! The red pepper flakes are a welcome addition. Thank you for the great recipe! when do you add them? You could add them to the slow cooker with the vegetables and broth to infuse the entire soup with a little heat or you could sprinkle a few on your soup when ready to serve. is there a different meat that might work in place of the ham for this recipe? I looked at simplegrocer, but I don’t need to buy 6 items (their minimum). Sausage tastes great in this recipe too! This was delicious! I made it exactly like the recipe called for. Everyone, even my skeptical husband, loved it! Yes! Thanks for sharing – we love to hear when our recipes impress skeptical husbands! 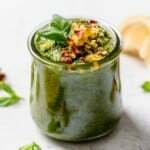 Is it possible to make this with ghee instead of another fat? Thanks for posting this. We had leftover ham from Easter Sunday, plus potatoes & kale in our CSA delivery today. I prepped the chopping this morning and can’t wait to try it tonight. A perfect recipe to use up leftover ham. Hope you enjoy it! a whole leak or a one leaf? A whole leek – the white part and light green part only. You can discard (or compost) the leaves. This was the tastiest soup ever!! Absolutely delicious and so creamy because of the potatoes! This will surely become a staple meal for our Whole30 fam! Wow, thanks!! It’s definitely in the Top 5 recipes in our house too. My kids and hubby ask for it almost every week. Feel free to omit the garlic or use less! Made this soup today in my Instant Pot (Electric Pressure Cooker). It was fantastic. I plan to play with the ingredients next time. I think I’ll use leftover chicken instead of ham and I’ll add some Whole30 compliant bacon. Yum! Shared on the ‘Instant Pot’ Facebook Group ???? Thanks so much for your kind works and for sharing in the Facebook group. Your idea of using chicken and bacon sounds fantastic. My husband and I both enjoyed this delicious soup. This was fantastic!!!! I like to make a pot of soup on Sundays and then I have lunch for the week (and some times breakfast. I used my own veggie stock instead of the chicken, since that’s all I had in the freezer. I used spinach instead of kale, since I like it better and added some coconut milk at the end, after the immersion blender. This is easy and so very tasty. This will definitely be added to my regular soup rotation! Thanks for sharing – glad you loved it! WOW! Just made this tonight for my family, and everyone loved it. Even the 5yo! The 10yo said she wants it tomorrow. I’m glad I doubled the recipe! Yesssss! We love hearing about family dinner wins like this one. So glad you all loved it! This sounds like a delicious winter soup. Do you think I could sub the white potatoes with cassava/yuca? Though we’ve not tried substituting yuca for the potatoes but I’d imagine it would work fine since they’re both starchy tubers. Please let us know how it turns out if you do. Made it for dinner with some leftover ham. Perfect light dinner after a weekend of indulgence. LOVE!! Just made this and it has such a great flavor! Super creamy and definitely a comfort soup. Absolutely delicious! 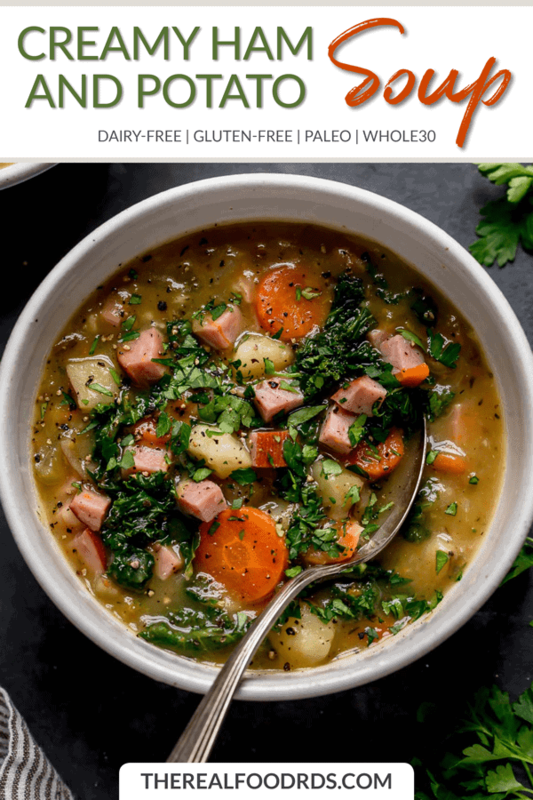 I’ve made it twice now, my family likes it and it fits MY dietary needs, I substitute the red potatoes with white sweet potatoes, this is a great soup! Thinking of making this for my family tonight can I omit the potatoes for cauliflower instead? We have not tested the recipe with cauliflower but I really do think it would work and be just as delicious! You’ll have to let us know if you give it a try. I made this for lunch today… SO GOOD!!! This was so tasty! I added a tablespoon of Apple Cider Vinegar to mine as well and that was a super yummy addition! Thank you so much for sharing your recipe!! Hi! For the slow cooker- should I sauté everything, add potatoes/broth/thyme, and then put it in the crock pot? And then blend after the 7-8 hours? 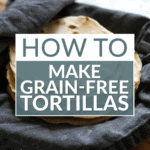 we love all of your recipes and are super excited for this one. Thanks!! You can just toss all the veggies into the slow cooker with the broth, thyme, etc. After the 7-8 hours they’ll be very tender. This was amazing! 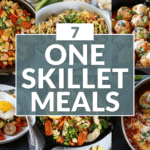 Super easy, and very doable for a weeknight meal. 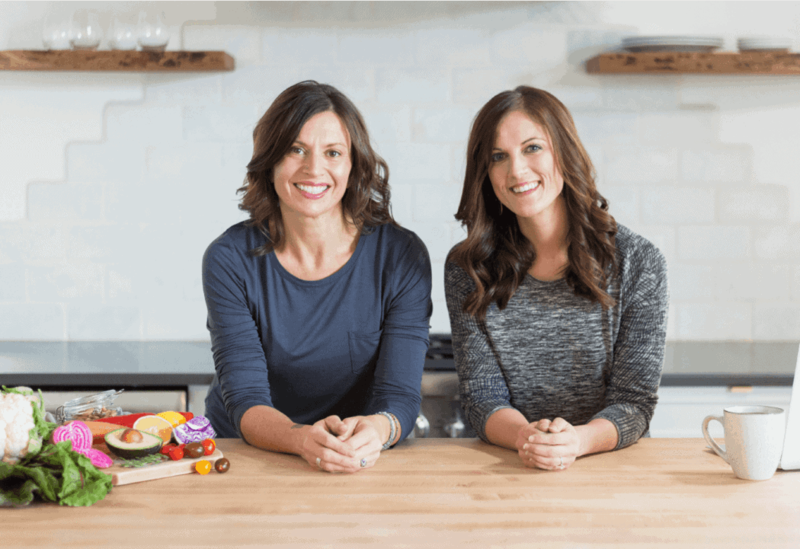 Everyone loved it – picky eaters, non-whole 30 eaters, my dad who when he hears anything is “healthy” automatically assumes it won’t taste as great. They all devoured it. Definitely becoming a staple. Thanks for such a great dish! 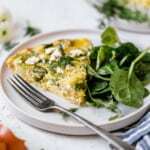 This is among one of the many recipes from your blog that I love. Thanks again! Hi there, curious to know if this could be a slow cooker option? Also.. what can I use to omit the cauliflower? Yes, you could make this in the slow cooker. I would add all of the ingredients except for the kale, ham, salt and pepper then cook on low for 6 hours or until veggies are very tender. Then you just need to blend, add the ham and salt and pepper to taste and cook an additional 30 minutes or so until the ham is heated through. As for the cauliflower, there isn’t any in this recipe. If you’re referring to kale you could replace that with spinach or another green of choice (collard, mustard, turnip, etc.) I hope that helps! I’ve made this several times now. It’s so delicious! All four of my children love it, which is saying a lot! Thanks for this great recipe! I love, love, love this! It’s a favorite around our house, too. How many cups of soup does this recipe make? Just guessing here but probably 7-8 cups. Just made this for the first time and really enjoyed it. I had some Canadian bacon in the fridge so I sauteed that and used it. This was a great way to use the random leek and kale that always ends up needing to be used. Amazing! And yes, such a great and delicious way to use up leeks and kale! Thanks for sharing. Holy moly, this recipe was absolutely delicious! Made it exactly as written except frozen spinach instead of kale. Seriously, I’ve been trying to manipulate my husband into liking soup (he just across the board says he doesn’t like soup 😑) and this was phase 3. I had to bribe him with some homemade biscuits to go along, but he LIKED it!! And anyone that isn’t prejudice against soup will completely love it. So hearty and creamy and comforting. Thanks so much!! This is so absolutely amazing. I love that he liked the soup and that you’re not above bribing him with biscuits (I’ve been known to do similar things). Thanks so much for sharing – here’s hoping this is just the beginning of a soup-filled marriage for the two of you! We loved this! I pureed everything but the ham and my kids loved that the potatoes make it taste “cheesy ” (can you tell we don’t eat dairy often? :) ) next time I might add brocolli just to make it more filling, no leftovers w 4 of us. Granted our boys have huge appetites. Thanks!! We also did whole 30 but this tastes great regardless!